Kleckner Elementary School was originally the consolidated Greensburg High School and Grade School. For a detailed history of this building, please see the Suburbanite Article entitled "A Look at Kleckner's History" originally posted March 4, 2011, available here. Built in 1903 as a four-room school on site of an earlier school, the site of the first advanced classes. The earlier school had a three-year advanced (high school) curriculum and graduated the first class of 3 students in 1902. In 1913 the first addition was added to make the school 8 rooms and accommodate a true consolidated High School for Green Township. All school districts across Ohio in the early 1900’s were moving toward consolidating one-room schoolhouses and building centralized High Schools. In 1927 a new addition was added to house an expanded high school. The 1927 addition included a gymnasium. In 1939 another new addition to house the High School was added as a Federal Emergency Administration of Public Works project. The gymnasium was expanded and bleachers were added to the gym as part of this project. On the morning of Wednesday, September 11, 1945 a fire struck the school causing damage to the older part of the school. The fire destroyed the parts of the school that were built in 1903 and 1913. The High School students helped remove supplies from the newer portions of the building while the fire burnt through the older portions. In 1947 another section of the school was constructed and attached to the existing portion that was built in 1927 and 1939 which was not damaged by the fire. The building was renamed Greensburg Elementary School in 1957 when the new High School was built on Steese Road. In 1981 the school was renamed again as John R. Kleckner Elementary School to honor Mr. Kleckner, a 1930 graduate of Greensburg School and a teacher, coach, and principal for many years at Greensburg School. In 1903 a school was built on Greensburg Road. This new school housed 8 rooms and accomodated students in grades 1-8. Since then, many changes have been made to our school. In 1913 an addtion was made to the elementary building to add room for the increasing enrollment. In 1927 and then again in 1939, two more additions were made so that the school could house grades 1-12. Indoor plumbing was also included in this phase of construction to the building. On September 11, 1945 fire destroyed the orignal buildings that were built in 1903 and 1913. In 1947 the current part of the building that is closest to Greensburg Road was built and attached to the exisiting 1927 and 1939 structures. (This is the reason that the 3rd floors of Kleckner do not connect.) The fire damaged buildings were than demolished and removed from the site. Greensburg School remained the K-12 building until 1957 when the "new" Green High School (the building now known as Green Intermediate School) was constructed and grades 7-12 moved to the Steese Road location. In 1981, the name of Greensburg Elementary was changed to John R. Kleckner Elementary in honor of the 43 years of service that Mr. Kleckner, teacher, coach and principal gave to Green community. Today, Kleckner Elementary school is home to over 600, 3rd and 4th grade students and 70 staff members. Greensburg High School was founded in 1899 at its present site. Previously, there had been fifteen different schools in Greensburg Township, but in 1899 all these combined into one room under the instruction of D. C. Cooper. There were forty students in this first class. At that time it was a three year course, and of these only four graduated in 1902. All four of these gentlemen are still living, and two years ago they were honored at the Alumni Banquet. Later the school was enlarged to four rooms, and in 1914 its size was doubled, making eight rooms. In 1927 the new high school was built. The gym was the same as it is at the present time, except that there was as it is at the present time, except there were no bleachers. Room 29 was the Freshman and Sophomore homeroom, while the Juniors and Seniors had their homeroom in what is now the Office. In 1939 the new wing was added, composing the main part of the High School. The Library, which has been in Room 35 was changed to its present location. The bleachers were also added to the gym at that time. In 1945 a fire occurred, and half the Grade School burned down. Temporary arrangements were made at East Liberty, and many of the students were transported over there for classes. Immediate construction was made on the school, and durring the winter of 1947, the students moved back into the new Grade School. Recently, thirty acres have been purchased on Steese Road for the construction of a new high school, which will take care of 600 students. It is hoped that the new school will be ready for use by the fall of 1955. On the left side of photo is the 1903 portion of schoolhouse (see additional photos below). 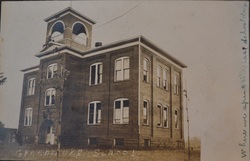 On the right side of the photo is an addition added in 1913, together serving grades 1-12. Addition to the 1903 portion.